It was less than 2 hour journey to reach Goravanahalli covering a distance of around 80km from Bangalore. 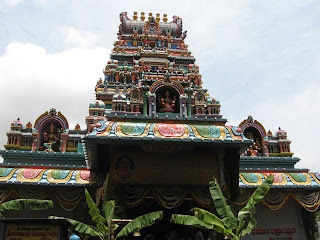 Goravanahalli is the abode of Shree Mahalakshmi, Goddess of wealth and prosperity. 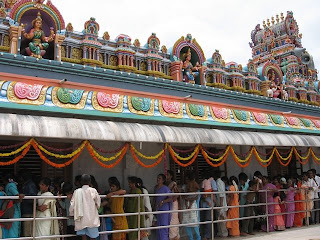 It is one of the famous pilgrimage centers around Bangalore, drawing a lot of devotees from Bangalore and elsewhere. 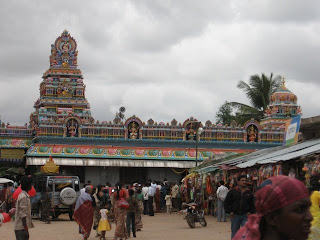 Goravanahalli is located in Koratagere Taluk of Tumkur district. It is said that Abbayya, a poor man was blessed to get the idol of Mahalakshmi. After worshipping Mahalakshmi at his home, Abbayya became rich. He started doing charity work and his home earned the tag ‘Lakshmi Nivasa’. Later Abbayya’s brother Thotadappa joined Abbayya in his charity work. After the death of Abbayya, Thotadappa was performing poojas to the Goddess. One day in his dreams, Mahalakshmi asked him to build a shrine for Her. So, Thotadappa built a shrine for Mahalakshmi. After Thotadappa, Chowdayya was performing poojas. But from the year 1910 the temple was in a neglected state. In the year 1925, Kamalamma on arriving at Goravanahalli, saw the neglected state of the temple. She started performing the poojas for the Goddess. Then again after a year temple was in a neglected state, when she left the place. But then in 1952, Kamalamma was back in Goravanahalli and settled there. After this regular poojas were performed by Kamalamma. In due time, temple attained fame by word of mouth. Tuesdays and Fridays are considered very auspicious here and lot of people visit the temple in these days of the week. 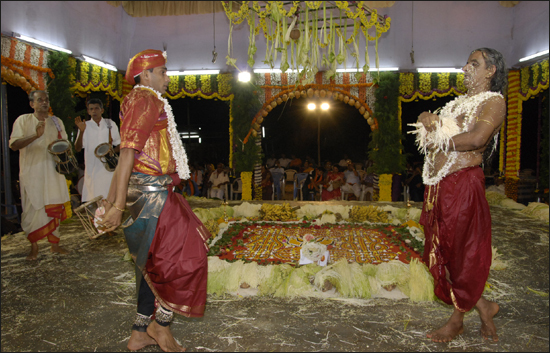 Lakshadeepotsava is one of the revered religious programmes here in Karthika maasa. Apart from Mahalakshmi, there are also shrines of Goddess Marikamba and Manchala Nagappa, the snake god in Goravanahalli. Goravanahalli temple is all surrounded by greenery and Theetha reservoir is nearby. People after visiting the temple, go for walk aroud Theetha reservoir. 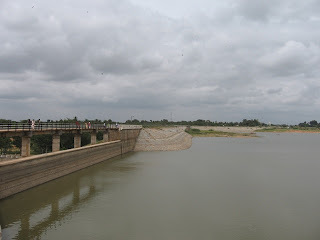 Theetha resevervoir is built for Suvarnamukhi river and it is also one of the attractions of the place. How To reach Goravanahalli : KSRTC buses ply from Bangalore and Goravanahalli. Also, one can reach the place from Tumkur, Doddaballapur or Koratagere. Hired/own vehicle is also a good option as Golden quadrilateral multilane road leading to the place gives a cool experience.